Both radical and exclusive, the Utopia Be speakers range is, above all, the result of an extraordinary human endeavour with the aim to reach an exceptional level of sound resolution. Working without constraints has allowed us to introduce, by the manufacture of a tweeter with a pure Beryllium inverted dome, a genuine world’s first that pushes back the limits of musical reproduction. The new C Series brings KEF’s audio technology and ‘know how’ to affordable hi-fi loudspeakers. 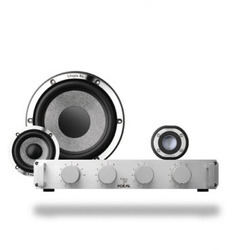 Both beautifully styled and incredibly versatile the C Series perform as well as speakers twice their price. For impressive power and impeccable audio quality, the RS-415 employs high-quality speaker components and clean, robust amplification in a rugged, lightweight enclosure. The result is a versatile, affordable speaker solution that’s ideal for a variety of DJ, install and PA applications. These type of Configurations suits where pre recorded CD, Cassettes are played for Dance / Music house or floor. CD / Cassette players are attached with Mixer & can be run individually or mixed combination.